Four of the main categories of Household Hazardous Waste include: Toxicity, Reactivity, Ignitability, and Corrosivity. Many of these hazardous wastes are leftover household products which can contaminate and harm the environment and the public. Household Hazardous Wastes (HHW) can contaminate groundwater and eventually lead into our water systems. It is becoming more popular to properly dispose of household hazardous wastes rather than disposing of them in the solid waste section of the landfill. More regulations are set to take place in the near future to prevent the contamination of our water systems that occur from the improper disposal techniques of household hazardous wastes. U.S. Chemical Storage offers complete protection and safe HHW storage with our fully compliant and 100% customizable Household Hazardous Waste storage buildings. We are dedicated to keeping the environment clean and strengthening individuals’ health with our Household Hazardous Waste storage buildings that offer proper disposal of HHW. Our interior solid partition walls give our HHW storage buildings the ability to separately store flammables, corrosives, and acids in the same chemical storage building. 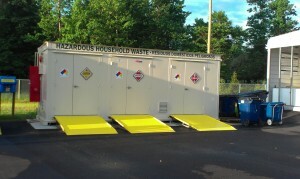 Hazmat storage buildings are designed to keep your chemical storage safe and maintained. Our extremely strong hand-welded, metal steel frame construction offers superior protection for your hazmat. Disposing of hazardous materials storage properly offers increased safety to the public and the environment. U.S. Chemical storage offers proper disposal techniques of hazardous materials storage. Our Household Hazardous Waste Storage building is our most trusted and dependable chemical storage building, which allows you to properly store household hazardous waste at your facility. Our buildings typically have multiple rooms separated by complete partitions so the buildings can store incompatible materials in different compartments. Keep in mind that our household hazardous waste buildings are always 100% customizable to fit your exact specifications for hazardous waste needs. Our buildings provide you with a place to store household wastes that are flammable, corrosive, combustible and other hazardous material that needs to be stored properly. Our chemical storage buildings are tested at our manufacturing plant before shipment to ensure that your household hazardous waste will be properly stored and maintained. Household Hazardous Waste Buildings are manufactured with built-in secondary spill containment to meet EPA 40CFR, NFPA 30 and other regulations to ensure site safety. UL Listed and Warnock Hersey Approved for ultimate safety. Our chemical storage buildings also come with customizable accessories to target your needs such as: climate control technology, 2-hour fire rated, 4-hour fire rated, non-fire rated and optional accessories such as Lights, Exhaust Fans, Shelving, and more.